The post The Interrupters Screening and Discussion appeared first on Grassroots DC. Beyond voting or joining a well publicized march or rally, many citizens are unsure how to become politically engaged. One of the most effective ways to have an impact on public policy is to tell your local representatives what you want. Lobbying is not just for professionals paid by corporate interest groups. In fact, government and the institutions they regulate are far more fair, just and equitable when regular citizens like you and me show up at their office and insist that they listen to what we have to say. With that in mind, the DC Alliance for Youth Advocates (DCAYA) will meet with Councilmembers and staff to advocate for a more youth-friendly District budget for FY2018 at the Wilson Building on Thursday, May 11. According to the DCAYA, the District’s proposed FY2018 budget leaves significant funding gaps for a number of key programs that could better address the needs of children and youth. For more information, contact Jamie Kamlet Fragale, Director of Advocacy and Communications for Academy of Hope Adult Public Charter School, or CLICK HERE. The post Lobbying on Behalf of District Children and Youth appeared first on Grassroots DC. The D.C. Office of Planning is amending the Comprehensive Plan, a long-standing document that outlines priorities for D.C.’s future growth and change. In a statement from the Office of Planning, Director Eric Shaw encouraged residents to read the Comprehensive Plan and make suggestions for changes. “‘Planning an Inclusive City’ is the guiding vision for the DC Comprehensive Plan. An inclusive city is one where every member of the community feels welcome wherever they are in the city, and where everyone has a fair and equitable opportunity to live a healthy, successful and fulfilling life,” Edward Geifer, associate director of the Office of Planning, wrote in an email to Street Sense. A heterogeneous coalition was born out of the Office of Planning’s call to the public. Community organizations, for-profit and nonprofit developers, faith groups, tenant advocates and other local organizations have formed a loose coalition of interested parties to identify priorities for creating more affordable housing and community support for under-resourced communities in D.C. The coalition met over several months to reach an agreement on a series of priorities that are listed on their website at www.DCHousingpriorities.org. According to the 2016 annual census done by the D.C. Council on Homelessness, 8,350 people experience homelessness on any given night in the city. Coalition members want to see growth in the city but also want the Office of Planning to know that growth does not mean pushing marginalized people further to the margins. “It is possible to build new housing, including a good measure of affordable housing, and grow the District’s tax base in a way that makes business sense and advances the public good. The result can be a combination of new housing and amenities for residents and increased revenue for the city so it can continue to enhance quality of life,” said Aakash Thakkar in the a news release. Thakkar is the senior vice president of EYA, a real estate development firm that is part of the coalition. Coalition members believe that more affordable housing and targeted support for D.C. communities should be in the Comprehensive Plan. Philip Stump-Kennedy told Street Sense that Latino Economic Development Center (LEDC) joined the coalition in hopes of using the Office of Planning as a tool for their mission. Stump-Kennedy is the regional tenant organizing manager at LEDC. He said he is tasked with the preservation of affordable housing in D.C, which is one of the priorities the coalition wants addressed. He referred to the lack of affordable housing in D.C. and said it is important that subsidized housing like Section 8 housing is maintained in the District. Stump-Kennedy also believes rent control is an important part of affordable housing preservation. The rest of the coalition agrees and lists the protection of tenants as a priority. Stump-Kennedy said that the LEDC focuses on organizing tenants, connecting them with attorneys and other tenant associations. Stump-Kennedy said there is strength in numbers and organization. “We need policies that preserve the affordable housing we already have as the District develops. It’s clear the city needs more units to meet the demand of the people coming here, but we also need strategies to protect tenants who are struggling to stay in the city. Those goals don’t have to be in conflict,” said Rob Wohl, a tenant organizer for the LEDC, in a news release. The coalition members believe that the development of affordable housing and equitable economics requires the participation of all D.C. communities in order to move toward a solution. A full list of organizations and businesses in support of the D.C. housing priorities can be found on their webpage. Residents can get involved by signing up for updates at plandc.dc.gov and submitting proposed amendments during the open call period for amendments. The post D.C. Seeks to Improve Its Comprehensive Plan appeared first on Grassroots DC. Within hours of the inauguration that so many of us missed, the pages on LGBT rights, civil rights, climate change, and health care were removed from the “issues” section of the official White House website. Like icing on a mostly Styrofoam replica of Obama’s real inauguration cake, the video below popped up on my daughter’s twitter feed as we were making our way home. I fear that the anti-Trump enthusiasm will wane as the long days of the Trump Administration stretch into weeks, months and years. On the whole, I’d have to say that January 20, 2017, was not a good day. The post Inauguration Day Blues appeared first on Grassroots DC. What will the Trump Presidency mean to the District of Columbia? With its status as a federal district, all laws passed by the City Council are subject to Congressional approval. Legislation like needle exchange programs and gun control have been held up and denied all together by Congress. We can blame the conservative members of the House of Representatives for spear-heading these efforts but even a majority Democratic House and Senate have failed to uphold the laws that District residents and their representatives have passed when they cross the sensibilities of the Right. With rumors that the Trump Administration plan to disrupt the District’s pro-choice and anti-gun legislation as well as the relatively new Death with Dignity Act, what can the many residents in favor of the legalization of Marijuana expect? Local marijuana advocacy group DCMJ tried to get ahead of the issue with a pro-marijuana demonstration. On the morning of the inauguration, DCMJ planned to distribute 4,200 joints. This video below, shot by Joshua Rose Schmidt, shows how things went. The post DCMJ Inauguration Day Protest appeared first on Grassroots DC. The post Black Lives Matter DC Reclaiming Martin Luther King appeared first on Grassroots DC. This is the first in a three-part series on Kaya Henderson’s time atop DCPS. The post See Ya, Kaya: ‘Legacy of Progress’? appeared first on Grassroots DC. Emily McDonald is a graduate student in the sociology department of George Mason University. She has been a volunteer intern for Grassroots DC since May 2016. In my time with Grassroots DC, I was given the underestimated task of tracking DCHA’s budget from the founding of Potomac Gardens on Capitol Hill until now. I began looking through HUD documents, only to find different structures of information for each year. I was able to track large budget numbers, indicating a large pullback in federal spending, but little evidence of what was appropriated specifically to DC. Rather, I found changing agreements between the federal and the local every few years with little overall consistency in the federal government fully funding the DC Housing Authority, leaving public housing residents feeling the pinch. As a sociologist, I started to see connections between what is happening with public housing in the United States and the current social concerns of our nation as a whole. Specifically, I started to understand that the fight for public housing cannot stop with pressuring local governments to subsidize housing authorities which were created to be fully funded by the federal government, but must also take on a the 21st century conversation about neoliberalism. HOW IS DCHA FUNDED AND GOVERNED? For a brief background, the process of funding DCHA is a bit more complicated than a strictly local DC agency. Funds are appropriated first to the the Department of Housing and Urban Development (HUD), then to local housing authorities. The District of Columbia Housing Authority (DCHA) is an entity of HUD and an independent agency of DC local government. This means the agency is particularly susceptible to federal pullbacks depending on the current political and economic ideology of the time, but is governed by a board appointed by the DC Mayor. The DC local government then subsidizes DCHA, though the only legal responsibility to fund the agency lies with HUD and the federal government. WHAT DOES THIS MEAN FOR PUBLIC HOUSING RESIDENTS AND ADVOCATES? It is important to understand the pullback of federal funding as a national trend trickles down to local spending. According to a 2016 DC Fiscal Policy Institute report, DC Council funding is not only a subsidy, but a requirement for DCHA to sustain. I found the same through DCHA director Adrianne Todman’s 2016 testimony to the DC Council. She urges for DC local spending to continue as they have for the few years prior. Her testimony includes an appeal for funding that is not only to promote new programs, but a basic necessity for the agency to sustain itself. I make this distinction to say Todman is not asking for additional money to add programming to additionally benefit the district, but a subsidy without which the agency may not operate at its expected capacity.This indicates the federal funding is insufficient for operation. The central problem is the basic capacity of DC local government in contrast to the federal budget. As the cost of living in the district increases for residents who have, quite literally, built DC local, they are left with little options for housing in the city that is their birthright. This remains particularly true for the elderly, disabled, and families with children. While DC local government is subsidizing the agency to ensure the operation continues, there is a changing landscape at the federal level that I argue requires a new form of understanding. According to theories of neoliberalism, big institutions are broken down, then slowly discarded in pieces in the name of private rule and small tax burdens on the rich (Brown 2015). This is often masked as freedom and flexibility for agencies like DCHA. Government programs aimed to support the lower and middle classes under a capitalist system are chipped away. Public-private partnerships are emphasized to reduce the burden of government. In turn, what is traditionally a public good paid for by publicly accountable funds are privatized. In terms of housing, The free market certainly has not shown the ability to self-produce adequate, accessible housing for all. Without the protection of dedicated public housing, the affordable housing market begins to dwindle, forcing low-income residents in the area to relocate elsewhere. According to a 2015 report by the DC Fiscal Policy Institute, since 2012, should the lowest DC residents not receive housing subsidies and reside solely in the private market, “the average rent for this group [would equal] 80 percent of average income” (p. 3). Essentially, non-subsidized housing is not an option for this population. The free market has also not promised higher wages for the lowest income residents. Public housing is a good that must be preserved should the district remain a diverse, inclusive place. This preservation will require more than pressuring DC local to subsidize DCHA, though I do not disagree this is an important point. However, eyes must remain on both the federal and local to sustain such public goods. I base this point on how public housing is structured in the first place, as a federal entity which ensures access to safe and consistent housing. Federal pullbacks allow for pressure to go to the states, but states and local districts are not necessarily bound to ensuring public housing remains a public good. With this understanding, I have come to conceptualize public housing in the context of economic justice that has popularized in mainstream conversations recently (i.e. Occupy Wall Street, the Bernie Sanders campaign, etc). The rich are richer than ever before, and even the most “progressive” of politicians are operating in a changed landscape where private solutions to public problems are valued as “sustainable” and “self-reliant,” across party lines in the United States. Advocating for public housing certainly requires pressure on local officials, but it will also require a strong stand against neoliberal ideology that is changing the environment in which our public life operates. The post Understanding How Public Housing Is Funded… It’s Harder Than You’d Think appeared first on Grassroots DC. Family and Friends of Incarcerated People’s Annual Community Event! It’s that time of year again, folks! Family and Friends of Incarcerated People is holding their annual community event. Join us, this Saturday, August 20, 2016 at Oxon Run Park, 1st and S. Capital Streets SE. The fun starts at 1:00 PM. The post Family and Friends of Incarcerated People’s Annual Community Event! appeared first on Grassroots DC. U.S. Political Prisoners and Prisoners of War… Who Knew? What do the Black Panthers, the American Indian Movement, the Puerto Rican Independence Movement, the Move Organization and Black Lives Matter have in common? They have all been denounced and delegitimized by the corporate establishment and mainstream media. The Civil Rights and Revolutionary Struggles of the ‘60s and 70s challenged American racism, classism and sexism. They also disrupted our imperialist foreign policy. Eventually, the United States Government brought down or seriously humbled the Black Panthers, the Anti-Vietnam War Movement, the Puerto Rican Independence Movement, the American Indian Movement, etc. Many leaders were jailed. Will the current struggle face the same fate? In the late 1990s, a movement to free all U.S. political prisoners and prisoners of war began to take root. Several wide scale political actions took place in Washington, DC and Philadelphia. Filmmakers, Liane Scott, Joan Yoshiwara, Eddie Becker and Jorge Abeledo covered these events. The result is The Walls of Jericho and the Movement That’s Shaking Them, a two-hour documentary, that includes activists protesting on behalf of Mumia Abu-Jamal, Leonard Peltier, the Move 9, the Puerto Rican Political Prisoners, Black Panthers Russel Maroon Shoats and Eddie Conway and many more. Revolutionary thinkers Kathleen Cleaver, Carl Dix, Chokwe Lumumba, Angela Davis, Ramona Africa all weigh in on the state of the movement and the related issues of police brutality and the prison industrial complex. Rank and file activists also share their knowledge and opinions. The Walls of Jericho serves as a popular education primer on political prisoners jailed as a result of the civil and human rights uprisings of the ‘60s and ‘70s. It cannot be denied that in the last half century, racism, heterosexism, xenophobia, etc. have become less overt. But at the same time, US military misadventures migrated from Central America and Southeast Asia to the oil-rich Middle East. The planet’s resources continue to be assaulted. Police brutality and mass incarceration replaced Jim Crow. The revolutionary work that blossomed in the ‘60s and ‘70s is not finished. Tactics used to disrupt activism of the past are and will be used again. We invite you to join us at this screening of The Walls of Jericho and the Movement That’s Shaking Them and the follow up discussion. In the spirit of Sankofa, we will learn from the past and move even more boldly into a future shaped by the people and not the forces of oligarchy. Below is a segment from the documentary that focuses on police brutality. The post U.S. Political Prisoners and Prisoners of War… Who Knew? appeared first on Grassroots DC. According to the Department of Employment Services, just five years ago, the unemployment rate in Ward 7 hovered around 19 percent. In Ward 8, it was routinely more than 20 percent. Today, the rates are 9.5 percent and 11.3 percent respectively. Ward 5, another area with stubbornly high unemployment has almost matched the overall unemployment rate in the District at 6.4 percent. This is all very good news. The bad news is that these decreases don’t seem to be reaching the District’s returning citizens. Approximately 67,000 individuals with a prior conviction reside in the District of Columbia, that’s 10 percent of the population. (1) According to the Court Services and Offender Supervision Agency (CSOSA) the percentage of unemployed among the offender population in the District for Black Non-Hispanic segment of the population was 64 percent in 2014. It is no wonder that returning citizens who want to provide for their families are challenged to do so. This remains true even for those who are more motivated than those in the workforce without criminal records. Councilmember Grosso’s point about bills subject to appropriation not being funded is a valid one. Dating back to 2001, the council has approved 42 legislative measures that have not funded to date, and six (6) partially funded. It is apparent that little or no effort was put forth by the BCRA committee to get the Executive to include Bill 21-463 in her FY2017 budget. The main objective for all returning citizens and their supporters should be to get the bill funded during the FY2018 budget cycle, and correct any other language issues that could render parts of the bill subject to legal challenges in the future. Also, to ensure that the Department of Small and Local Business Development be clarified as the lead agency, and DOES act in support of this important effort. We hope to get amendments to change the legislation accordingly in the near future. Passage of the bill clearly shows that the council views entrepreneurship for the returning citizens as a viable economic development strategy. The DCRTF believes the full council supports proper funding for the bill, which will effectuate real change in the lives of our returning citizens and their families. The post D.C. Council Passes Entrepreneurship Program for Returning Citizens… But It’s Not Funded appeared first on Grassroots DC. So, you’ve been horrified by the many murders that we’ve witnessed in the media. You wonder what you can do? Here are some events coming up this week that could help to plug you into the movement. The resurgence of the Movement for Black Lives and the 2016 elections: Which way forward in the movement for real change? You can also support the movement by supporting the Black Lives Matter Guiding Principles. Aaron Goggans , an organizer for the Black Lives Movement in the Washington, D.C. area, lays them out below. Below is a slightly modified version of the guiding principles adapted from the recent Movement for Black Lives Convening. #2 was added in order to contextualize the principles for non-Black people working in solidarity for the movement. They help paint of picture of what the Movement for Black Lives is and should provide and excellent starting point for discussion. 1. ALL Black Lives Matter: Queer Black Lives, Trans* Black Lives, Formerly Incarcerated Black Lives, Poor/Working Class Black Lives, Differently abled Black Lives, Black Women’s Lives, Immigrant Black Lives, Black Elderly and Children’s Lives. ALL BLACK LIVES MATTER and are creators of this space. We throw no one under the bus. We Rise Together. 2. All of our work is part of a larger movement for collective liberation. The movement for collective liberation is a movement for liberation every human being on the planet from each and every system of thought, belief or action that oppresses them. This means that none of us are free until all of us are free. This also means that heart of this struggle is those who experience multiple forms of simultaneous oppression. Furthermore, this requires that all allies see their Black liberation work as part of their work towards their own liberation. Women’s Liberation, the overthrowing of capitalism, Asian Liberation, Queer Liberation, Trans*Liberation, Indigenous Liberation, the end of colonialism etc are all connected, vital, and must work together. 3. Thriving Instead of Surviving: Our vision is based on the world we want, not the one we are currently in. We seek to transform, not simply react. We want our people to thrive, not just exist. Think beyond the possible. 4. Experimentation and innovation must be built into our work. Embrace the best tools, practices and tactics and leave those behind that no longer serve us. 5. Evaluation and assessment must be built into our culture. Critical reflection must be part of all our work. We learn from our mistakes and our victories. 6. Principled Struggle can exist in a positive environment. We must be honest with one another by embracing direct, loving communication. 7. Love/Self Love is practiced in every element of all we do. Love and Self-Love must be a driver of our work and an indicator of our success. Without this principle and without healing, we will harm each other and undermine our movement. 8. 360 degree vision: We honor past struggles and wisdom from elders. The work we do today builds the foundations of movements of tomorrow. We consider our mark on future generations. 9. Self-care means we build resilient spaces by budgeting time, energy, and resources for healing. Self-care is a regular, consistent, intentional, and essential practice. 10. The most Directly Affected People are experts at their own lives and should be in leadership, at the center of our movement, and telling their stories directly. 11. Training and Leadership Development should be fundamental. Our movement must constantly grow and leadership must constantly multiply. 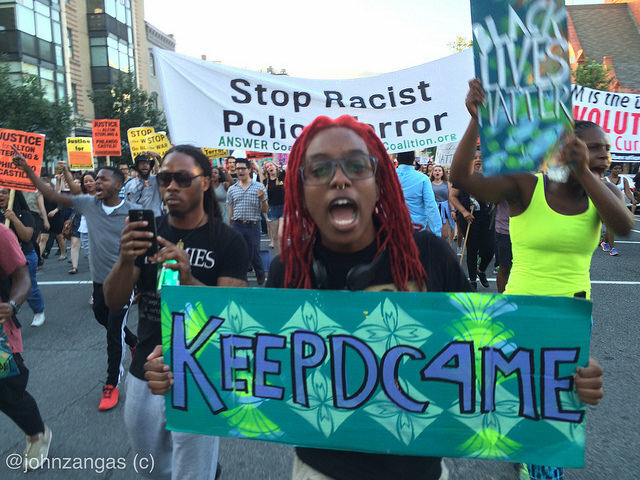 The post Movement for Black Lives Guiding Principles appeared first on Grassroots DC. Washington, DC — The Movement for Black Lives continued protests to denounce recent killings of Black men on Saturday night in Washington, DC. The Stop Police Terror in DC Project, BlackLivesMatterDMV, BYP100 (Black Youth Project) and allies met at the African American Civil War Memorial and marched through city streets and into Georgetown. Once there they blocked traffic on the main M Street thoroughfare and then blocked Rock Creek Parkway. The protest lasted over three hours, walking several miles through the city and resulted in no arrests. Many joined along the way, including activists, youth, and families. The new protests came as video reports came to light of more killings by police of Black men. Delrawn Small, 38, was killed by an off-duty police officer in a road rage incident in Brooklyn, NY. A video published online countered claims by an off duty police officer that Smalls had allegedly punched the officer in the face. Smalls was shot less than two seconds after approaching the unmarked police vehicle. Another man, Alva Braziel, 38, was shot 10 times by police in Houston, after he went looking for his horse which had gone missing. In that incident Houston police said that Braziel had brandished a firearm. Smalls and Brazeil are the 655th and 671th individuals respectively killed by US police in 2016. But Eugene Puryear, an organizer with The Stop Police Terror In DC Project, recognized that the Black Lives Matter movement had made progress. “It’s only been a couple of years since we’ve been pushing, and already we’ve brought this issue to the forefront of the country,” said Puryear. Yet a mass shooting of Dallas police officers during a protest Thursday night, which resulted in five police killed and seven wounded, cast doubt that unrest would end any time soon. “When you have a situation when over a thousand people are killed every year by police and no real resolution in the court system…it’s like putting a pot on boil and eventually it’s going to boil over,” said Puryear. He said the increased national tension is moving the country towards a boiling stage, and change must now happen both socially and politically. Reports of Black Lives Matter protests dominated the Sunday morning news. Protests were reported in major cities across the country as tensions rose over the spate of recent killings. Area groups planned to hold a vigil at the African American Civil War Memorial Sunday night. The post Black Lives Matter Protests Continue in Washington, DC appeared first on Grassroots DC. In June, Mayor Muriel Bowser announced proposed changes to training requirements for special police officers. The following is the response by Pan-African Community Action. WASHINGTON DC: Pan-African Community Action (PACA), the organization of Beverly Smith, mother of Alonzo Smith who was killed by special police November 1, 2015, responded to the announcement of Mayor Muriel Bowser, Deputy Mayor for Public Safety and Justice Kevin Donahue, Metropolitan Police Department Chief Cathy Lanier, and Director of the Department of Consumer of Regulatory Affairs Melinda Bolling proposing changes to the training requirements for commissioned special police officers (SPOs) in the District.The proposed changes are said to be in response to the circumstances in the cases of Alonzo Smith and of 74-year-old MedStar patient James McBride, also killed by SPOs Sept. 29, 2015 at Washington Hospital Center. In Alonzo Smith’s case the fact of the matter is that there appears to be no justifiable reason for arresting him in the first place. Authorities and the press consistently ignore that it was an unarmed Alonzo last heard crying out “Help! Help! They are trying to kill me!” which was the reason the MPD was called to the scene by Marbury Plaza apartment residents where he was killed. Not by the officers in question. The proposal for new and improved training of special police by the Mayor is yet again more smoke and mirrors from the demand of the Justice 4 Zo campaign for a full account of what happened that night. Video made public by the DC government shows that Alonzo was shirtless and shoeless when the MPD found him laying face down with one of the SPO’s on top of him with the officer’s knee pressed into his back. MPD immediate complicity can be witnessed in the video by their treatment of the SPO’s false claim that Alonzo was “on K2,” a term referring a synthetic drug that causes hallucinations. MPD called in the claim as fact, later to be disproven by the coroner’s report. To keep tunnel focus on the actions that caused Alonzo’s death, while neglecting the broader circumstances and motive can serve as a cover up of what could well be outright murder by the officers, who for untold reason remain unidentified. The City’s proposal for training, following the May 17, 2016 DC Superior Court grand jury indictment of SPOs Clifton Montgomery and Charles Brown for involuntary manslaughter of McBride, is suspected of being a political maneuver to prepare the public and the community concerned with the case of Alonzo to accept a similar outcome without question. inability to hold violent police officers, security guards and vigilantes accountable for their discriminatory actions. The weak recommendations for more training of SPOs will not in the least bit alter the pattern and practice of Black people being murdered by guards of the status quo, whether MPD, neighborhood watch, Metro Transit Police or so called “Special” Police Officers. Therefore, we of the Justice 4 Zo campaign reaffirm our call for community control over the police as the only solution for ending this crisis. Additionally the announced proposal is further proof that an independent dual track investigation by the United Nations and/or the Organization of Independent States is necessary. For interviews with Beverly Smith or any other member of Pan-African Community Action send email to paca@protonmail.com or call Netfa Freeman on 301-938-4628. The post Mother of Alonzo Smith and PACA Respond to DC Mayor’s Proposed Regulations on Special Police and Security Officers appeared first on Grassroots DC. The DC State Board of Education Requests Input on the Every Student Succeeds Act and More! Like their counterparts across the country, DC’s State Board of Education and State Superintendent of Education are in the process of leading the city in the transition from the No Child Left Behind Act to the new federal education law that replaced it in December 2015–the Every Student Succeeds Act. As a part of that process, the Board has set up a page on its website just for ESSA and on that page there is a survey in three languages: English, Spanish and Amharic. The public is encouraged to email the Board with any thoughts that don’t fit on the survey. There is also a schedule of meetings the Board is holding across the city to provide an overview of the new law and its requirements and to hear the public’s views and thoughts. The meetings are Ward based but they are not limited to residents of the particular Ward—anyone is free to attend the meeting in any ward. The Board’s ESSA page also has a video-recording of its March 16 meeting where three very knowledgeable people with long experience in public education, policy and law presented their understandings of the new law and there is a document called “What YOU Need to Know About ESSA” in a power point format that shows some of the contrast between NCLB and ESSA and many of the requirements and other factors to be considered as DC works out its own plan for what its public education system should be accountable for and how it will do that. See next page for more resources and last page for schedule of the meetings. Screenings also took place on June 1 and on June 4. For more information, see www.doee.dc.gov or call 202-535-2600, TTY711. ● US Department of Education, www.ed.gov/essa explains it all and has a link to the law itself. ● National Conference of State Legislatures provides a summary at www.ncsl.org, type ESSA summary into search box. A law, “Childhood Lead Screening Amendment Act of 2006” that became effective on March 14, 2007 requires that all children living in DC be screened for lead by the age of 6. + If a child who lives in the District has not been screened at these ages, they must be screened at least once before they are 6 years old. So, children born in DC since 2007 should already have had two screenings by the time they are two years and 2 months old as part of their well-baby check- ups. Parents or guardians with questions should contact their child’s doctor. The Coalition for DC Public Schools and Communities, which holds to a set of Six Principles by which education decisions should be made, sent a questionnaire to all the primary election candidates for councilmember and posted the responses on www.C4DC.org for all to read. In addition to being sent to all the Primary election candidates, the questionnaire was also sent to Independent At-Large David Grosso who will be on the November ballot and is currently the chair of the Council’s Committee on Education. While some candidates did not respond much can be learned from those who did. B21-0683, The Comprehensive Youth Justice Amendment Act of 2016, was introduced on April 5 and referred to the Committee on the Judiciary. (2) the placement of individuals under the age of 18 into adult penal institutions; and (3) the transfer of legal custody from parents or guardians to a government entity after a finding of delinquency as relating to a child under the age of ten. Nearly seventy witnesses testified at the hearing on June 2. The record for written testimony ends at close of business on Thursday, June 16, 2016. DC’s bill to protect the privacy of student data, Bill 21-578, the Protecting Students Digital Rights Privacy Act of 2016, had a hearing on March 21 and is still under Council consideration according to a staff person at the Committee on Education office on June 6. Meanwhile the National Association of State Boards of Education, NSABE, released a report in May called Trends in Student Data Privacy Bills in 2016. Among its findings is that some 400 bills on this subject have been introduced in state legislatures since 2014. This year, they say, 38 states have considered 112 new bills as well as 73 bills that were carried over from 2015. The report notes that one of the bills from last year, California’s Student Online Personal Information Protection Act (SOPIPA) directly regulates third parties in contrast to bills in Colorado and Connecticut that distinguish between contracts schools sign with third parties, such as for cloud storage, and products where there is no negotiated contract. DC’s state board of education is a member of NSABE and At-large member Mary Lord was president of the association last year. See www.nsabe.org for its Policy Update of May, 2016 with full report. Globalize DC, a local non-profit, is planning an after-school program, at no cost to students, focusing on the Japanese language and culture for about 25 high school students from DCPS and charter schools. To learn more, contact Sally Schwartz at 202-251-1692 or by email at sally.schwartz@verizon.net. June 17 last day of school for DCPS. Students will be dismissed at 12:15 pm. June 27 DCPS Summer school programs begin. See www.dcps.dc.gov for complete schedule. June 19 HAPPY FATHER’S DAY! June 30 Deadline for DC Tuition Grant Applications (TAG). For more info go to www.dconeapp.dc.gov. Citizen Reader is a project of Livingview Communications-a citizens’ information service. Contact: ess.livingston@gmail.com with corrections, letters to the editor or to subscribe. Thanks! The post The DC State Board of Education Requests Input on the Every Student Succeeds Act and More! appeared first on Grassroots DC. The fight to increase the amount of affordable housing in the District of Columbia should also include efforts to maintain the city’s public housing. It was a need for clean, safe and affordable housing that prompted the creation of public housing in the 1930s. That need still exists today but our willingness to fund it has been on the decline since the 1960s. Today, the Public Housing Operating Fund—the main source of revenue for public housing maintenance and repairs–pays for only 86% of the items in HUD’s budget. It looks as though the D.C. City Council may at long last be trying to make up the difference with the Public Housing Rehabilitation Amendment Act of 2016. The problem that those who advocate on behalf of public housing have with the bill is that it won’t pay for maintenance if the housing is slated for redevelopment. So if you live in Barry Farm, Kenilworth Courts, Park Morton, Highland Dwellings or Lincoln Heights–all properties scheduled for eventual redevelopment–you’re out of luck. The article below provides more details. Members of the Empower DC housing campaign and residents of public housing took a walk around the Wilson Building weeks before the first FY2017 budget vote to meet with council members and discuss their budget priorities. The residents have been calling for desperately needed repairs to both occupied and unoccupied units of public housing managed by the D.C. Housing Authority (DCHA). The residents have been requesting work orders for more than six years, some properties haven’t been properly maintained since the 1980s. In March, At-Large Councilmember Elissa Silverman and Councilmembers Brianne Nadeau (Ward 1), Charles Allen (Ward 6) and Mary Cheh (Ward 3) introduced a bill that would provide funds for maintenance of existing public housing units. It is a great move by council, but public housing residents still had some concerns regard language within the bill. To Lee, there is no observable sense of urgency on these issues. “These are people’s lives we’re talking about,” he said. “These are the same arguments we present you all the time.” The bill has not moved forward since a notice of intent to act on it was published in the District of Columbia register on March 18. The post Proposed Bill to Fund DC Public Housing Repairs Raises Concerns appeared first on Grassroots DC.